Leishmaniasis (leesh-muh-NYE-uh-sis) is a parasitic infection spread by sand flies. It causes symptoms ranging from sores on the skin to damage to internal organs. The disease occurs when a person becomes infected with any of several types of Leishmania parasites * . They spread to people through the bite of female sand flies and can cause different forms of illness, all of which are called leishmaniasis. Cutaneous (kyoo-TAY-nee-us) leishmaniasis affects the skin; mucocutaneous (myoo-ko-kyoo-TAY-nee-us) leishmaniasis attacks the mucous membranes * in the mouth, nose, and throat; and visceral (VIH-suh-rul) leishmaniasis (also known as systemic leishmaniasis or kala azar) damages internal organs, such as the liver * and spleen * . * mucous membranes are the moist linings of the mouth, nose, eyes, and throat. * liver is a large organ located beneath the ribs on the right side of the body. The liver performs numerous digestive and chemical functions essential for health. Cutaneous and mucocutaneous infections can lead to severe scarring and permanent disfigurement. In patients with a mucocutaneous infection, the disease can destroy soft tissue in the mouth and nose, drastically deforming the face. The visceral form of the disease is considered the most dangerous. It can grow worse over time and is usually fatal if not treated. Leishmaniasis damages the immune system so that it cannot fight off infections; these infections are generally the cause of death, not leishmaniasis itself. In some countries, visceral disease has been found with increasing frequency in people who also have human immunodeficiency virus * infection. The infection is most common in tropical and subtropical regions, such as countries in South America, Africa, and Asia, and the number of areas where it occurs continues to grow. The U.S. Centers for Disease Control and Prevention (CDC) estimates that one and a half million people around the world contract cutaneous leishmaniasis each year and half a million people experience the more serious visceral form of the disease. Ninety percent of the visceral cases are found in just five countries: India, Nepal, Bangladesh, Sudan, and Brazil. Leishmaniasis is exceptionally rare in the United States, although a few cutaneous cases have been diagnosed in rural southern Texas. People cannot get leishmaniasis directly from other people. Instead, the disease spreads through the bite of blood-sucking sand flies. A fly bites an infected animal or person and takes in the parasite with its meal of blood. The Leishmania parasites reproduce in the fly, which can spread them when it bites another person. Sand flies are quite small—about a third of the size of a mosquito—and fly silently, so people often do not even know the flies are nearby. Less often, the disease can be transmitted through contaminated blood in a transfusion * , by sharing or reusing needles for injecting drugs, or from a mother to her baby during pregnancy or birth. Cutaneous leishmaniasis is marked by sores that often look like volcanoes: they have a central pit and a raised rim. They can be painful or painless and may be covered by scabs. The sores tend to appear on the face, arms, and legs, and some people have as many as 200 of them. Patients with cutaneous leishmaniasis also may have swollen lymph nodes * near the sores. In mucocutaneous cases, the lesions appear in the mouth, nose, and throat and gradually destroy the soft tissues in those areas. * human immunodeficiency (HYOO-mun ih-myoo-no-dih-FIH-shen-see) virus, or HIV, is the virus that causes AIDS (acquired immunodeficiency syndrome). * transfusion (trans-FYOO-zhun) is a procedure in which blood or certain parts of blood, such as specific cells, are given to a person who needs them because of illness or blood loss. * platelets (PLATE-lets) are tiny, disk-shaped particles within the blood that play an important role in clotting. The visceral form of the disease can cause lack of appetite, serious weight loss, fever (which can last from 2 weeks to 2 months), and increasing weakness. It also can lead to an enlarged spleen and liver and sometimes swollen lymph nodes. Blood tests may show that the patient has low levels of white blood cells, red blood cells, or platelets * . As the disease progresses, the skin can become dark and dry—a symptom that gave the disease the name kala azar (meaning "black fever"). In children, visceral leishmaniasis often begins suddenly, with fever, diarrhea, and cough. 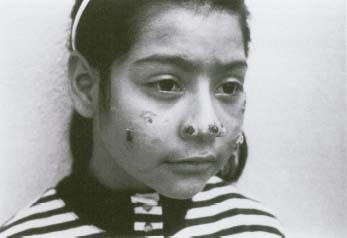 Cutaneous leishmaniasis affects the skin, causing sores that may look like volcanoes: they have a central pit and a raised rim. The disease can destroy tissue and lead to permanent scarring. How Do Doctors Make the Diagnosis? A key to making the diagnosis is learning whether the patient has traveled to a country where leishmaniasis occurs. During the physical examination, the doctor also checks the patient's body for the types of sores seen with the infection. The doctor may take blood samples and tissue samples from any sores that are found. These samples will be cultured * , examined for signs of the parasite, or tested for antibodies * to the parasite. For suspected cases of visceral infection, biopsies * of the abnormal tissue may be done. Doctors treat the infection with prescription medications; many of these medicines contain antimony * . Cutaneous cases usually can be treated at home, but visceral disease may require hospitalization and supportive care, such as intravenous * fluids. Patients who have severe disfigurement from cutaneous, and especially mucocutaneous, leishmaniasis often need reconstructive surgery to regain a normal appearance. However, such extensive (and expensive) treatment is not available to vast numbers of people in developing countries who contract this disease. * cultured (KUL-churd) means subjected to a test in which a sample of fluid or tissue from the body is placed in a dish containing material that supports the growth of certain organisms. Over time, ranging from hours to weeks, the organisms will grow and can be identified. * biopsies (BI-op-seez) are tests in which a small sample of skin or other body tissue is removed and examined for signs of disease. * antimony (AN-tih-mo-nee) is an element that has properties of both metals and nonmetals and can kill or inhibit the growth of certain bacteria. How Long Does the Disease Last? Although some cases of cutaneous leishmaniasis clear up on their own, most cases of mucocutaneous and visceral infection will not get better without treatment. Left untreated, visceral disease typically leads to death within 2 years. Cutaneous cases may take several months to heal, even with treatment, and may return after the treatment has been completed. What Are the Complications of Leishmaniasis? The cutaneous and mucocutaneous forms of leishmaniasis often cause widespread scarring. In mucocutaneous cases, destruction of tissue in the mouth and nose can lead to facial deformity. Visceral disease can damage the immune system to the point that it is unable to fight off other infections. Some patients may need to have the spleen removed if it is trapping and destroying too many of the person's blood cells, and advanced cases of disease often result in death. Can the Disease Be Prevented? Avoiding sand fly bites is the best way to limit the spread of leishmaniasis. In areas where the flies live, people are advised to stay inside from dusk until dawn, when the insects are most active. Wearing long-sleeved shirts, long pants, and socks and tucking pants into socks can reduce the amount of bare skin that is vulnerable to fly bites. Using insect repellent, staying in screened-in or air-conditioned areas, sleeping under mosquito netting, and spraying living areas with an insecticide to kill flies also can help lessen the risk of being bitten. * intravenous (in-tra-VEE-nus) means within or through a vein. For example, medications, fluid. or other substances can be given through a needle or soft tube inserted through the skin's surface directly into a vein. U.S. Centers for Disease Control and Prevention (CDC), 1600 Clifton Road, Atlanta, GA 30333. The CDC provides a fact sheet and other information on leishmaniasis at its website. World Health Organization (WHO), Avenue Appia 20, 1211 Geneva 27, Switzerland. WHO tracks disease outbreaks around the world and offers information about leishmaniasis at its website.